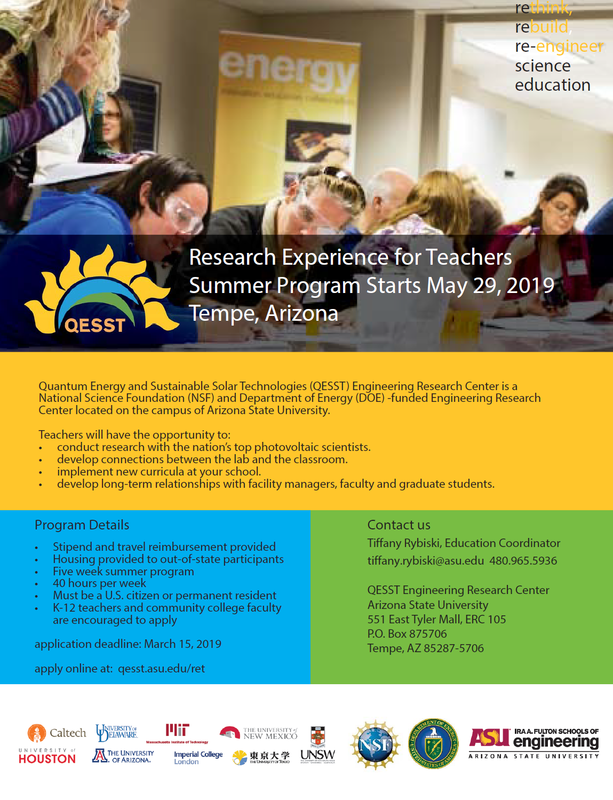 An intensive five-week research experience for K-12 and community college faculty at ASU’s Solar Power Laboratories. Conduct research with nation’s top photovoltaic scientists with open access to the lab equipped with industrial grade fabrication equipment. Work with engineering education researchers to develop connections between laboratory and classroom. Spend one day a week outside the lab, working on curricula, demonstrations and lab projects tailored to the needs of your students. Develop long-term relationships with facility managers, faculty and graduate students. Receive additional support to ensure implementation of your curricula at your home institution. All materials developed during the program will be made available to the wider community college system through PVeducation.org. Applications will be considered after the deadline date until all positions are filled. Applicants must submit a completed application and curriculum vitae.